As some of you who follow me on Instagram know I do love a bit of vintage and have developed quite a collection. Sadly I am now running out of room and the time has come to have a bit of a clear out. 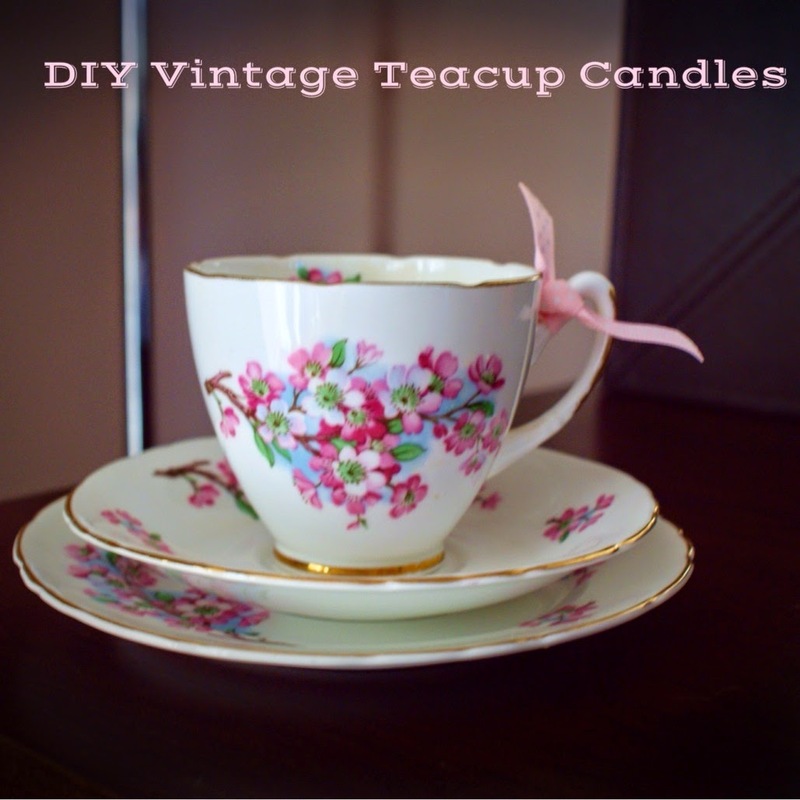 My friend has just bought her first home and she also shares a love for vintage pretties so I have passed some of my things on to her and with my extra vintage china trios I decided to turn them into pretty vintage tea cup candles. This is a win-win situation as I am clearing out my excess vintage tea cups and making Christmas presents all at the same time. I bought the candle making items on eBay but I’m sure you could buy them in craft shops too. 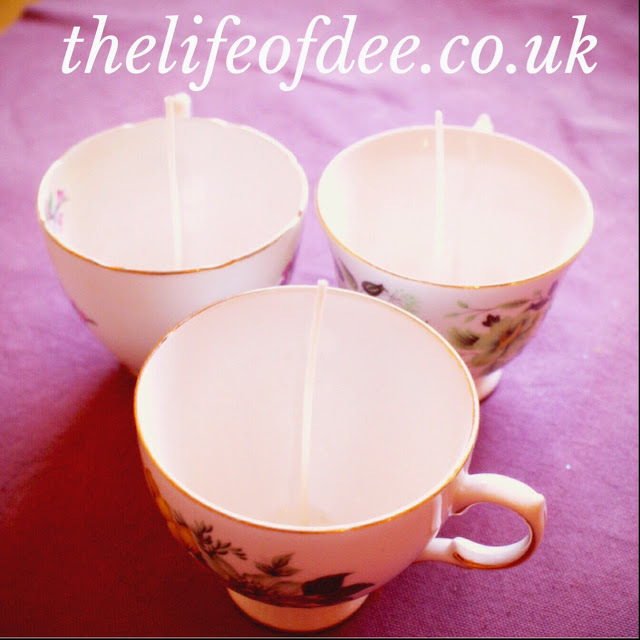 Measure out how much wax you will need, the best way is by filling the cups you will be using and doubling the amount eg 2 cups of wax = amount required for 1 completed teacup candle. Stick the wicks to the bottom of the cup by using blu-tac or sticky glue dots. 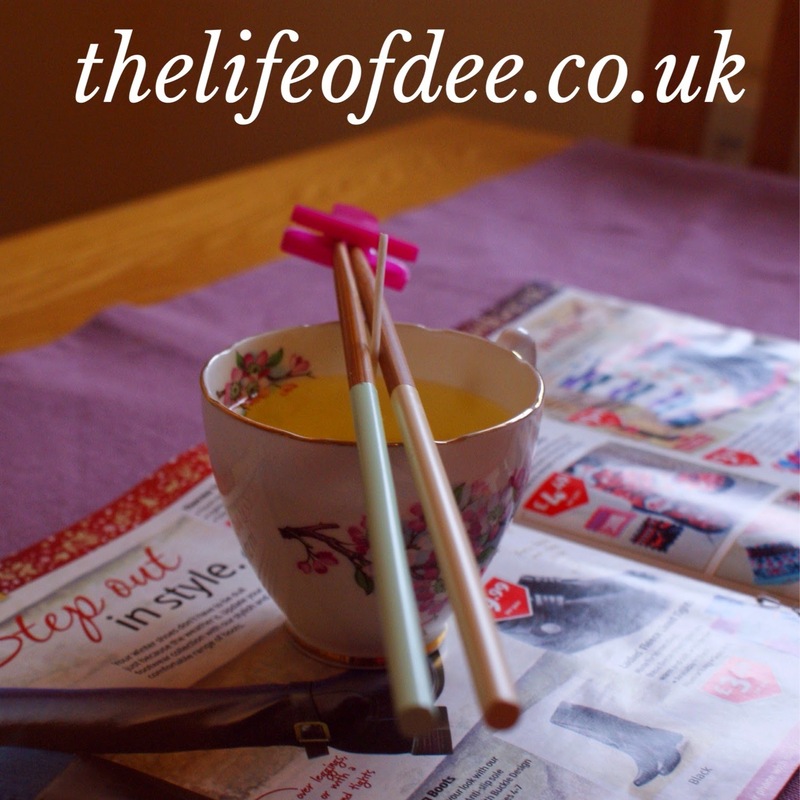 Hold the wick in place by securing between 2 wooden skewers (I couldn’t find my skewers so improvised with chopsticks and a freezer bag clip) as you want the wick to remain in a central position once the wax has been put in. I don’t have a double boiler so I used a large pan and placed a stainless steel jug inside it. Make sure the pan always has water bubbling away and never let the pan run dry. If it does need filling then use water from a pre-boiled kettle to top it up. Place the wax into the jug and let it melt. Attach the thermometer to the side of the jug so you can regulate the temperature. Once the temperature reaches 175F you can then add your fragrance, I used Spiced Apple Pie for one lot and Fig and Cassis for the other. If the temperature is too high when adding the oil the scent will be burned off. Stir the wax for 2 full minutes to evenly distribute the fragrance. Reduce the temperature to around 150-155F and carefully pour the melted wax into the teacups making sure you don’t knock the wicks while doing so. Leave the candles to set fully overnight before moving. Trim the wick to the required length. Your candles are now ready for you to wrap up and give to your friends or if you want to keep them for yourself then light them. Let me know if you decide to make them. I’d love to know what scents you used. "Blogmas Day 5 – Favourite Christmas Music"
They look so cute. I've always wanted to have a go at making my own candles! Hi, sorry for the late reply. Thank you so much for dropping by, were normal candles easy to make? I did wonder if they would be easy to take out of the moulds. Teacup candles are so easy, I definitely recommend making one. They make lovely gifts too :).